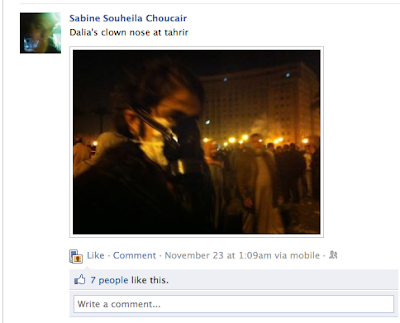 The protests in Tahrir Square have been the hot topic in Lebanon since last week; in the Choucair household this was compounded by the fact that Sabine was in Cairo, and meant to be giving a clown workshop, when the demonstrations broke out. Her current facebook page is a bit like a sociological debate on the value of art in a revolutionary society. A couple of days they actually held clown improv. sessions before and/or after hitting the streets in their “high tech clown noses” (read: gas masks). Other days this was impossible. Finally Sabine put her foot down and canceled the classes, to the dismay of many of her students I’m sure. For the workshop to have value, there needed to be consistent attendance, something that was impossible in this context. Gandhi and MLK might be rolling in their graves at this point. I’m not sure I have any answers, but I do know that many in my generation struggle with the efficacy of protests in general…I think of the G8 rallies and how similar they looked to this “brand new” Occupy Wall Street movement. I think of the millions who marched against war on my birthday in 2003, and wonder how much change that day concretely manifested. I think of the stories that the ex-fighters have been telling me about their pre-war experiences, and I am chilled and thrilled by their incredible description of the rallies, the protests, the marches they took part in; the tremendous potential energy of a common cause. But it’s just that—potential energy. Whether or not we gather it is almost besides the point; consciously—and creatively—figuring out what to do with it is the bigger and more difficult question.